Hi we stayed at the Marilena on an sc basis. Rooms basic but clean and pretty large. Theres a fridge, kettle toaster 2 ring hob with oven. But plenty of tavernas, bars within a 2 min walk, so no need to cook. Maids came in 3 times a week. Rooms were spotless. Pool is small but very clean and you get the sun from about 7am to about 6pm. The owners daughter pops by everyday to ask if everythings ok which was a nice touch. The apts are located at the cala d or end of the strip. Just across from the three little pigs taverna and siesta bar. All in a big thumbs up from us. to all those who moan , how else whould we get there? pool was spotless and staff were so ever nice . evrything about it was astonishing . friendly atmosphere and set back from the shops and bars so no late-night noise would happen.kitchen had fridge , 2 or 3 cooking rings a cooker and a microwave . it always had a basket of fruit or flowers everytime it was cleaned. id say it is a 6 star!!!!! 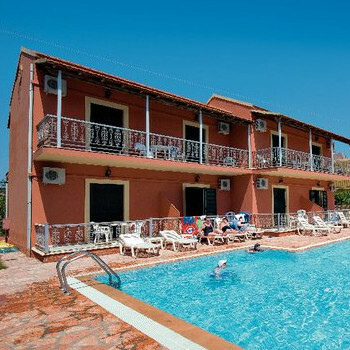 The Marilena Apartments were very vlean and tidy, the pool was lovely, although a bit cold. It is a small place with only 10 apartments and no staff around exept when the cleaners come every other day. We really liked it there as it was only a few hundred yards away from all the entertainment and from the beach.